Degrees of Separation is the story of two polar opposites who travel an unknown world together and find love along the way. Ember exudes the warmth of a perfect spring day; Rime chills the air, freezing any moisture in his path. 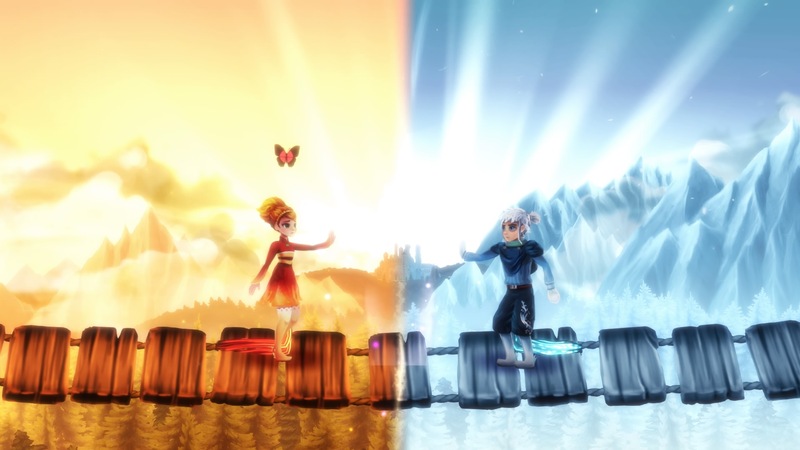 Using their relationship with nature to your advantage, you will guide them through the stunning new world beyond the mysterious castle and cross your fingers that these two contrasting individuals find a fairy tale ending. Degrees of Separation is a sugary treat for the senses. The art direction is so vibrant and breath-taking. The transitions from warm to cool as you alternate between the two are so smooth and seamless. I can (and will) literally stand still for minutes on end enjoying the scenery. Sometimes, I’ll get lost in it when I should actually be trying to solve the puzzles. This is my first game from the small indie team at Moondrop, and it turns out they have a penchant for creating these dynamic types of worlds. Single players will be manipulating both Ember and Rime in order to reach new heights and collect the scarf pieces strewn about the beautifully designed worlds. (Two-player play is available.) The first area is purely based on using their respective elements. For example, you could use Ember’s warmth to light the lanterns and raise them high, or Rime’s chill to extinguish and lower them. You don’t need to collect every scarf fragment to unlock the next area. I appreciated that, seeing as some of the pieces I couldn’t figure out how to reach the first time through. Coming back with a fresh set of eyes did help me collect a few more. In the second world, a new mechanic was added. Here, I could form a solid barrier between Rime and Ember based on where the screen split. This was wonderful for creating bridges and ramps. I could reach new perches and pulleys, and this was exciting! I tried taking this new ability to the castle and the forest with plans to solve some more puzzles, but it was not to be. The third world hurt so much that Ember got glitched in the ground and I just didn’t care anymore. Fine. With enough scarves to open the third door, I grabbed my Player 2 for Life and loaded up this next area. We tried to create the barrier, but it wouldn’t work. Okay, let’s move forward and see if maybe we needed to move away from the entrance. Instead, we discovered that the creators had given us another new mechanic to use. This time around, bringing Rime and Ember closer resulted in an explosion with knockback. This became so nerve wracking that, after 15 minutes, my husband and I both declared all interest in playing further done and switched to our daily The Elder Scrolls Online events. This wasn’t my only gripe with the gameplay; each world has a map of sorts depicting where the scarf fragments are. Unfortunately, there isn’t a great way to figure out their position on the map in relation to the waypoint markers. So when I went back to the first level to find scarves I skipped previously, it made using the waypoints pointless. I had to start from the door and slug all the way back through, keeping my eyes peeled high and low. This started to feel like a chore, which is what I use video games to avoid. 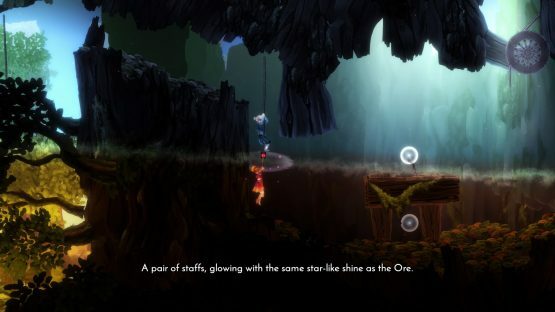 In a week where I had two puzzle-platformers land in my lap, Degrees of Separations comes out on the bottom. The entire time I was playing it, all I wanted to do was switch back to The Liar Princess and the Blind Prince. 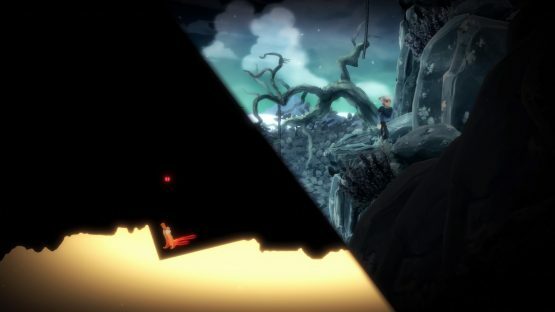 Especially once I hit the third world in Degrees of Separation, where puzzle solving was no longer a fun challenge, but a grueling test of my patience. I wanted to love it; the art, the soundtrack, and the story were what had my heart set on enjoying while playing this one. I hate to say it, but I’m not sure if I’ll ever attempt to put all the stars back in the sky. Degrees of Separation review code provided by publisher. Version 1.01 reviewed on a standard PlayStation 4. For more information on scoring please see our Review Policy here.